For SimonDr, DMMD customized Visere Medical into WhiteCap. Using a plugin approach, DMMD has developed different plugins to support SimonDR and its DR data acquisition module. Visere Medical, which has the same functionality as WhiteCap and is available to anyone interested in developing a DR XRay System. Please contact DMMD for more information. The first family of plugins is data acquisition. These plugins are used to acquire data from an external device, such as a CCD sensor, a flat panel, a digital camera, or any other hardware. The second family of plugins is image processing filters. These filters are used to post-process the image data. They include filters such as: denoising, unsharp masking, applying curves, and many others. 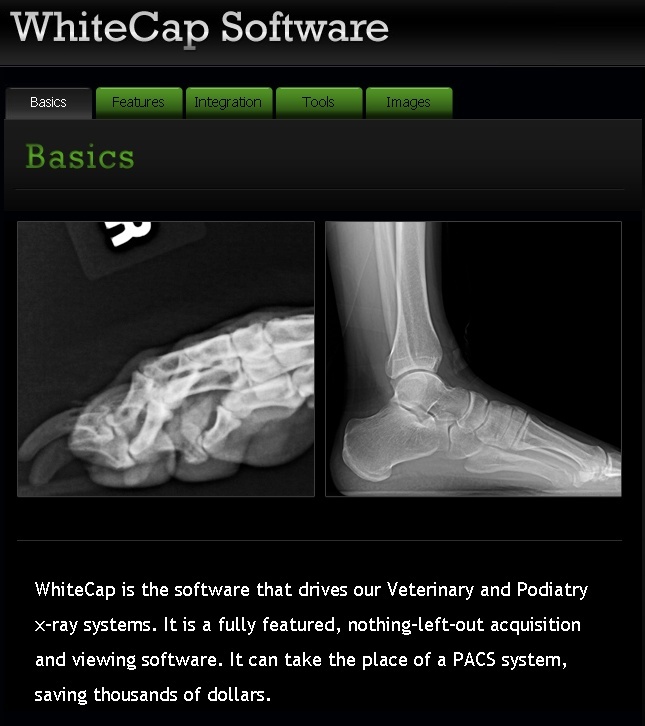 DMMD and SimonDR continue to enhance and develop WhiteCap into a state of the art image acquisition, processing and viewing software package that continues to enhance the productivity of many veterinarians around the world.